Giving an accurate estimate is a huge part of a successful move, you know that. Without an accurate estimate, you are likely to have problems on the move. Although you can get an accurate estimate over the phone, on-site estimates have always been the best way to get to most accurate estimate. Nowadays, movers have another option. 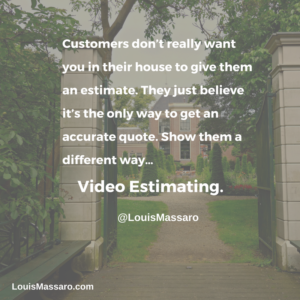 Video estimates! 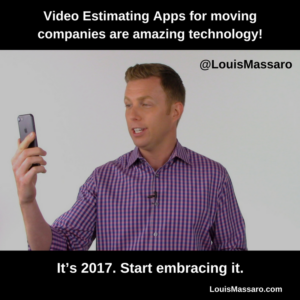 In the episode, I share cool new video estimating apps for moving companies to give accurate estimates without leaving your office. Two companies have created apps that allow you to give an estimate without getting in your car and driving to the customer’s house. These apps will allow you to transition from a call with your customer to a video conference call using the customer’s cell phone. The customer will then walk through their home and show you everything they are moving so that you can take an accurate inventory. iMover – Starting with a free plan! SurveyBot – Starting at $20 per estimate. Both of these apps are designed to do pretty much the same thing. Their features are slightly different. I would suggest you check out both and see which one appeals to you. You can always use FaceTime or Skype to do video estimates as well, but they lack the features and professionalism that these two apps provide. 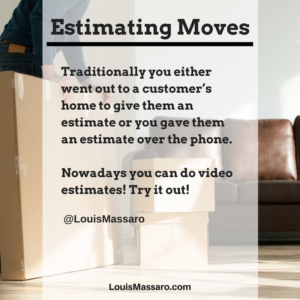 These video estimating apps for moving companies offer a cool service that will help you differentiate your company from the competition. 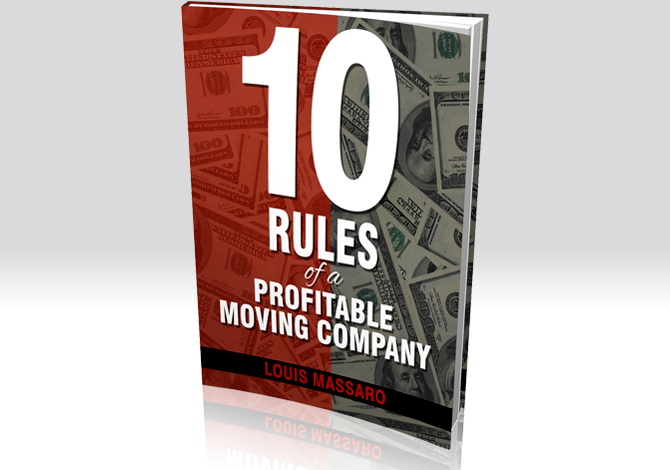 Hey, my friend, it’s Louis Massaro, CEO of Moving Mastery and founder of Moving Sales Academy. Today, I wanna talk about estimating moves and the different ways that we could go about doing that. Typically, traditionally, there was either you went and did an on-site estimate, where you went out to their home and visually saw everything that they have, or you did an estimate over the phone and try to gather an inventory and put it into your system, so you can get an accurate weight and give them an estimate. Well, nowadays, you could do video conferencing and video estimates. There’s software out there like iMover and SurveyBot that are basically apps that the customer would download on their phone and be able to take a recording of everything that they have in their home. So they would go room by room and take a recording, and from that recording, you can then give them an accurate estimate based on what you’re seeing instead of based on what they’re telling you. So now, you don’t have to go out to the house, spend the time and the fuel, and pay the extra commission to the sales person. And you also don’t have to risk giving a phone estimate and not getting the accurate inventory. 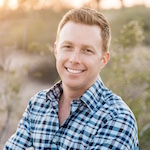 So with these apps, you could actually do it live with your moving consultant on the phone, so your moving consultant could actually be, it could be like a FaceTime call. But what will happen is as they’re doing this, your consultant, your sales rep is seeing what’s in the customer’s home and they’re able to talk to them at the same time while this is going on. It’s pretty amazing. I’ve recently downloaded a few of them and it’s really a great technology and to be able to provide that to a customer, to be able to say, “You know what? How about I just send you a link right now while we’re on the phone.” And if they’re calling from their cellphone, you could essentially turn that cellphone call into a video call just by sending them a link and having them click on it. It’s pretty cool stuff. And customers don’t really want you in their house. They wanna get an accurate estimate and they believe the way to do that is for you to come out there and give them a quote. But if you’re able to do it and see everything that they have without going out there, it saves them from having strangers walk through their house and it saves you from having to go out to homes. Now, it doesn’t replace on-site estimates completely, although it could. There’s still a need for on-sites but there’s a lot of times where you don’t need to go do an on-site but a phone estimate’s not gonna cut it. By doing a video survey, you have the information right there. And what happens is, once you do that, and I keep doing this, I think it’s the coolest thing. 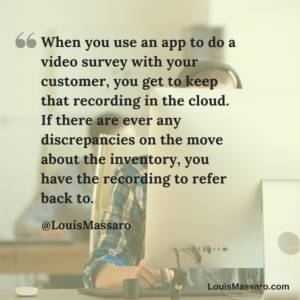 So when you take that video survey and it records, you get to keep that information in the cloud. So if there’s ever any question, if there’s ever any issues, if there’s customer service problems at the end of the move, you have the recording of what the… Remember, this is not you with the phone, this is the customer showing you everything that they have. So I just wanna make sure you guys knew about this technology. I know it’s been out there for a little while now. Check out iMover, check out SurveyBot, they’re two great options. I think iMover might have a free, premium, freemium, whatever it’s called package. I think SurveyBot’s a little bit more expensive, but check them both out and see which one works for you. At the end of the day, you really could use FaceTime, you really could use Skype. But if you wanna give a professional image, if you really wanna give that customer a unique experience, try one of these apps. Try them out, see if you like them, and you’re just gonna be able to do things a little bit different. It’s 2017, the technology out there is crazy and it’s just gonna keep getting better. And I just wanna applaud these two companies for coming up with these ideas, and I hope to see some more great stuff out there like that. If you have any great technology, if you have any useful software apps, tools, anything like that, that moving companies would benefit from, let me know, I’d love to hear about it. Until next week, go out and profit in your business, thrive in your life, I’ll see you later.